And so it has come to pass that Governor Doug Ducey, the ice cream man hired by Koch industries to run their Southwest subsidiary formerly known as the state of Arizona, bowed to the demands of the contemptible Septuagenarian Ninja Turtle, Senate Majority Leader Mitch McConnell, and purposefully disregarded the will of Arizona voters in a democratically held election in November by appointing the election loser, Rep. Martha McSally, to John McCain’s vacated Senate seat as a consolation prize. Why do we even bother holding elections if our authoritarian GOP masters feel free to do whatever the hell they want to do without any regard for the will of the voters they pretend to represent? Sinema will assume the role of Arizona’s senior senator, and will be sworn in on Jan. 3, with the new class of senators, Ducey said at a joint news conference Tuesday with McSally. In prepared statements, Ducey thanked Kyl for his service and invoked McCain’s legacy of service. “As I now deploy to the Senate, I pledge to devote all of my energies to ensuring that all Arizonans have a voice,” she said. Enough with the damn combat lingo! You can always re-up in the Reserves and go fly more combat missions if that is what really gives you your jollies, Martha. Ducey cited McSally’s military background and six deployments to the Middle East and Afghanistan. He also noted her battle with the Pentagon years ago to overturn a policy that required U.S. servicewomen in Saudi Arabia to wear Muslim abayas and headscarves. McSally’s one claim to fame, her opposition to wearing a head scarf while in Muslim countries, was not universally shared by her fellow female officers in the Air Force. Lt. Col. Cheryl Garner, USAF Best Defense guest columnist for Foreign Policy (March 2011) wrote Hey, it should be our choice – The Best Defense – Foreign Policy. To those critical of the appointment, given McSally’s loss, Ducey noted that she earned the support of 1 million voters. So what? Hillary Clinton won the popular vote by almost 3 million votes despite an unprecedented effort from Russian interference to elect Donald Trump president. Did Hillary get a consolation prize for losing the electoral college? No. Did Al Gore get a consolation prize for winning the popular vote, but losing the electoral college vote 5-4 in Bush v. Gore? No. This is the most ridiculous illogical argument ever (lookin’ at you Laurie Roberts). Ducey’s pick may anger an array of voters, from liberals and independents who rejected McSally in November to conservatives who view her as having blocked former state Sen. Kelli Ward from exciting the GOP base during the 2018 primary election. Ducey’s decision also may not sit well with another portion of the Republican electorate — the so-called “McCain Republicans” who were unsettled by her spurn of the senator as he battled cancer during her 2018 Senate race. Well, Republicans will have two years to prepare their recriminations because the voters who rejected McSally this past November will be loaded for bear coming after the “anointed one” who was rewarded with a Senate seat as a consolation prize despite her having been rejected by Arizona voters. McSally will pay the price for this rejection of democratic elections and basic sense of fair play. Tom Perez, chairman of the Democratic National Committee, vowed his party would defeat McSally again. The Democratic Senatorial Campaign Committee called McSally “a loser” in decrying the governor’s pick. 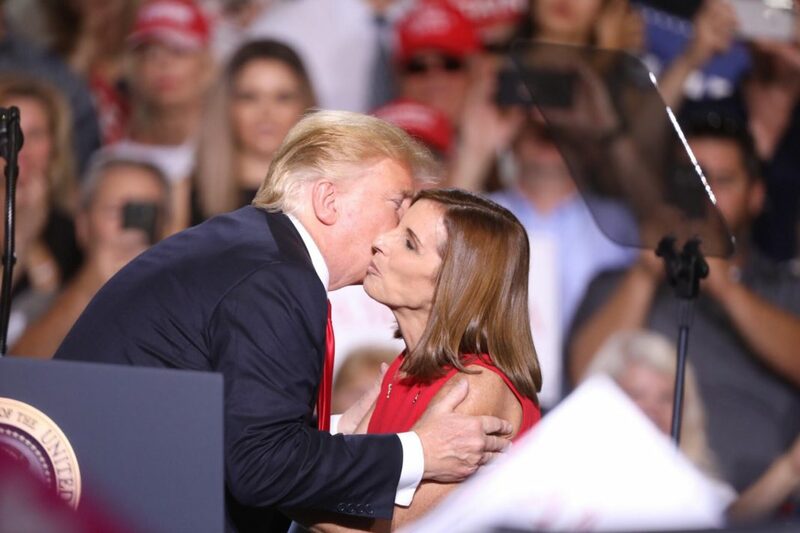 Larry Sabato, the political scientist who directs the University of Virginia’s Center for Politics, warned that the choice could backfire for the GOP if McSally doesn’t act more like McCain. “Her voting record might end up pretty much the same as temp-appointee Jon Kyl. But after losing Senate race this year, she faces voters again in ’20. Some maverick moves could help her,” Sabato said in a series of tweets. Nicole Brener-Schmitz, the political director of NARAL, which supports abortion rights, said McSally is in league with extremists. The left-leaning League of Conservation Voters and its affiliated Chispa Arizona again panned McSally for her environmental record. “The people of Arizona have already rejected Martha McSally for this job. As a Congresswoman, she has supported a $25 billion tax windfall for oil companies and voted to block safeguards against air pollution. Her support for the fossil fuel agenda is limiting Arizona’s clean energy potential, contaminating the air we breathe, and exacerbating health disparities among Latinos, low-income families, and people of color,” said Chispa Arizona Executive Director Laura Dent. I believe that the only reason she narrowly got elected to the House of Representatives a few years ago was that her handlers duped Hispanics into voting for her by running TV ads in Spanish while I never saw a Spanish language ad by the incumbent Barber. It’s of course a shame she’ll be known as Senator McSally because incumbents always get a certain percentage of votes from name recognition. It can be hard to unseat them.